All Products > "03128 Revell 1/72 Warrior MCV"
The Warrior mechanised combat vehicle developed for the British Army went into production at GKN Sankey in 1986. 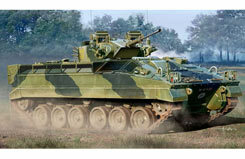 The first vehicle, officially designated the FV510 Warrior Mechanised Combat Vehicle (MCV), was delivered to the 1st Battalion the Grenadier Guards in May 1987. The aluminium armour of the Warrior offers protection against shells up to a calibre of 14.5 mm as well as splinters. There is room for up to seven soldiers in the rear troop compartment and a large right-hung door in the rear to enable rapid debussing.